A smallish group of Vestact clients own Tiger Brands shares. To be exact, there are 77 owners, and their combined holdings add up to R15,399,259. To put that in perspective, we have 462 clients who own Naspers, and those holdings are worth an aggregate amount of R266,191,349. Of course, Tiger Brands has had a very rough time lately. An outbreak of Listeriosis (Listeria ST6) at one of their meat-processing plants in the Limpopo Province lead to the deaths of an estimated 200 people. A series of class-action lawsuits have been filed against the company, and are now working towards the courts. The recall of meat products such as polony, russians and bacon, and the shutting of these factories has already cost R365 million (net of initial insurance claims). Prior to this, there were two other major crises in Tiger Brand's recent past. A bread price-fixing scandal in 2007 and a debacle from 2013 when the purchase of Dangote Flour Mills in Nigeria resulted in multi-billion Rand write-offs. As you can see from the chart below, where the different divisions are shown to scale by their revenue, the meat division is not that enormous. Tiger is still mostly about grains, milling, baking and groceries. Consumer confidence in brands such as Albany, Tastic, Ace, Jungle, Koo, All Gold and Oros is unaffected, and still very high. 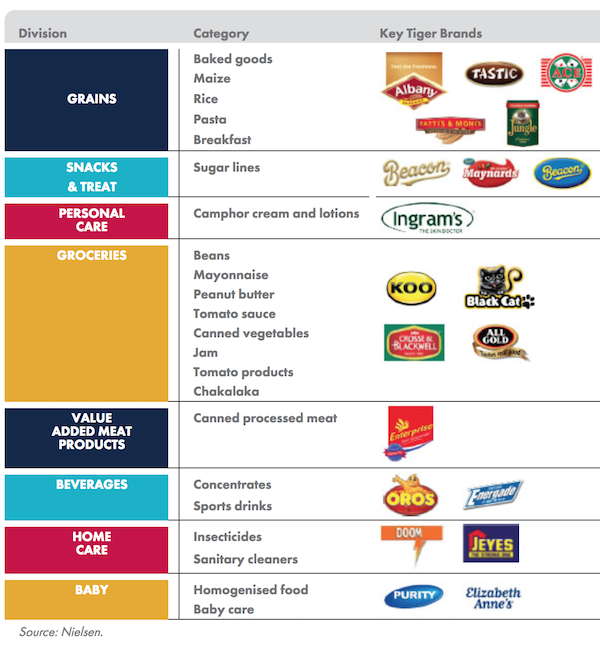 Tiger Brands had results out last week for the six months ended 31 March 2018. Revenue declined 4% to R15,7 billion, and operating income declined 8% to R2,0 billion. Gross profit margins were still decent at 33,3%. Headline earnings were down 16%. The interim dividend was unchanged at 378cps. Holding the dividend is significant - it means that the board feels that normal profitability will return in time. In more general terms, this has not been a good period for consumer-facing companies in the South African economy. Food producers are battling, as demand for their products is weak. As we know, the job market is stagnant, unemployment remains high, and wage levels are not rising. Retailers who sell clothes are battling. Grocery stores are complaining of stagnant sales levels. Restaurants have fewer customers than they would like. What does it mean? Is this just a cycle or is the problem permanent? Old hands will tell you that its always the cycle. Hang in there and wait for better times to return. For now, Tiger Brands is probably just too cheap. In January this year, it was trading at R474 per share. When the listeriosis crisis broke it plummeted to R350 per share. In recent weeks it has slipped further to R337 per share, thanks to weak sales expectations. It's trading on a historic price to earnings ratio of just 17 times. The cost of the class action suit settlements will be significant, but not unaffordable for a company of this size. The best thing to do if you hold these shares is to hang in there and wait for better days.